Tibetan Rituals, Practice for Beginners? I have been studying Buddhism in general for a long time, but am trying to learn more about the Tibetan tradition. I've read a lot of books by Pema Chodron for example, but they speak more of the "mindset" and "practicing compassion", etc. That's all great, but what I'm looking for specifically are explanations of a day in the life of a Tibetan Buddhist. What kind of rituals are practiced, and why? Are there days of observance, and how are they celebrated and why? I know very little of the who, what, where and why of Tibetan rituals. Are there special meditations for Tibetan buddhists? Special additions to the meditation alter? Specific activities? If anyone can tell me some specifics of Tibetan rituals & traditions, observances, etc. I would appreciate it. Or links to websites that explain this stuff with a beginner in mind would be great. Re: Tibetan Rituals, Practice for Beginners? You can do prayers and some practice like Shakyamuni Buddha, Medicine Buddha and Tara. kirtu wrote: You can do prayers and some practice like Shakyamuni Buddha, Medicine Buddha and Tara. Thank you, but can I ask for a little clarification? Are those three things types of Buddhas, or actual practices? I'm trying to search for these practices online, but only coming up with historical references to Buddhas, but not practice descriptions. This looks like a great site to explore, thank you Yeshe. Ooh, I especially love talks, chants, anything on mp3, that first site looks especially good, thank you! I can recommend the book, A Beginner's Guide to Tibetan Buddhism, by Bruce Newman. I got it used for like $1 on Amazon. It's very clear and covers lots of basic stuff, to give you some sort of context of both philosophy and practice in Tibetan Buddhism. Get a copy of The Day of a Buddhist Practitioner by Bokar Rinpoche. lisehull wrote: Get a copy of The Day of a Buddhist Practitioner by Bokar Rinpoche. Lisehull, I checked out the table of contents of that book on Amazon and ordered it immediately! That's exactly the type of practice description I'm looking for, " a day in the life of" type stuff. It appears to be out of print but I grabbed a used copy from one of the Amazon sellers. Thanks for the suggestion, I'm looking forward to reading it. Really good suggestions from everyone so far, looking forward to any other sites, books, whatever. This is a great help. Also, I'd still like to find some resources on celebrations, special meditations or rituals, days of observance, stuff like that. some people poo poo, ritual, they only see it from a narrow view and say oh it is all superstition and cultural baggage, but this is wrong understanding. ritual is communication, it is energy and intention, purification, commitment and real understanding. 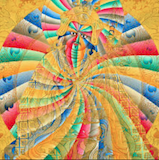 Heruka wrote: some people poo poo, ritual, they only see it from a narrow view and say oh it is all superstition and cultural baggage, but this is wrong understanding. ritual is communication, it is energy and intention, purification, commitment and real understanding. I agree. This is why I'd like to find more information on the various rituals so that I can understand them and perhaps practice them as I get more involved with the Tibetan tradition. But I'm having trouble finding a beginner's resource that explains the rituals and what they mean, etc. dakini_boi wrote: I can recommend the book, A Beginner's Guide to Tibetan Buddhism, by Bruce Newman. I got it used for like $1 on Amazon. It's very clear and covers lots of basic stuff, to give you some sort of context of both philosophy and practice in Tibetan Buddhism. I second this book - I found it very, very useful and it covers an awful lot of the information you're looking for. It's well worth getting. You don't mention whether you're involved in a community at the moment. That is where you're going to learn how to do rituals like smoke offerings etc. As for sadhanas, they're restricted to those with empowerments (with some exceptions). I'm sorry, I think I mentioned it in my introduction post but not here. One of my biggest problems is that I live in a very remote area and there are no Sanghas, study groups or teachers around here. Believed me, I've looked. I'm just very remote; I live on the side of a small mountain. There aren't even like-minded people around here that I can find. Very small Christian town in the middle of nowhere. So I'm kind of on my own in this venture. There really is no "community involvement", I wish there were! I'm trying not to let that fact get me down. Some (on another forum) said I can't do this without a teacher, or at least a Sangha, but others have said that's silly and that of course I can. I do know that I am really relying a lot from books and the internet for most of my knowledge. What exactly are you trying to achieve by your study and practice of Buddhism? If you answer that question as honestly as possible, I think you will clarify for yourself whether or not you absolutely must have a Nirmanakaya (i.e., flesh and blood) Teacher. In other words, if you yearn day and night to achieve Buddhahood for the sake of all sentient beings covered by the sky as quickly as possible, then you absolutely must find a Teacher and, finding that Teacher, follow His or Her teachings as best as you can. Given your situation, that probably means coming down off your mountain. Think of your mountain as Siddhartha's palace. Siddhartha had to leave his palace in order to set off on the Path. Ironically, while many practitioners leave the city and go to the mountains based on their Teacher's (s') instructions, for you, your "austerity" may be to study and practice in the heart of Times Square. "Leaving home" is a time-honored part of most really serious seekers' Path. For instance, Kyabje Chatral Sangay Dorje, perhaps the most realized Lama living in the world today, left home at 15 to seek the Dharma. In any case, there is no practice of tantrism, let alone Vajrayana, without a Teacher. So don't delude yourself by thinking that you can practice that level of Buddhism out of books or from info gleaned from the Internet. It requires live transmission from an authentic lineage. Otherwise, the magic just doesn't work. Just my two cents based on more than 40 years of being a "refugee." Take it or leave it. In any case, the best of luck. its mostly chanting, ringing bells etc. it is a very demanding style of meditation. I agree with pemachophel's points... You don't need to move somewhere where there is already a teacher and sangha to practice with, although that couldn't hurt. You just need to be able to take some time to travel to and attend teachings that may not be in your immediate area. Most people I know do this, --most people are not lucky enough to have a fully qualified Vajra Master live next door to them. Some people fly from other continents to receive teachings for a week or a month, then they return home and put them into practice. I myself do this when possible. So save money, save vacation time, whatever you need to do, so that when you realize there is a connection with a teacher who you feel may be the real deal you can get to where you need to be for the teaching. It is rather useless to just begin imitating some vajrayana rituals without having the transmission for them. For the time being, it is probably best to simply study the philosophy, and do whatever sutra level shamatha and vipashana meditation you may already have familiarity with. This can only help later on. . . I don't know.... People told me the same thing with the violin. No teachers nearby; I had never played a musical instrument, and didn't even know how to read music. People said "You can't do this without a teacher, you should have started this as a child, it's a fretless instrument, it's very difficult", etc., and you know what? I taught myself how to read music, and I taught myself the violin and learned the notes by ear. It took me YEARS, but now I can play both classical pieces and celtic fiddle, and quite well, all without a teacher or lessons. So I have a hard time when someone I "can't" do something on my own.... It's not like I want to be Lama; claiming to be an expert and showing others. I just want to learn more about the practice for enrichment and study. Of course it's much more difficult without a teacher, but I never asked if it was okay if I do this, that's between me and my heart. I was just asking for learning resources. I don't see anything wrong with earnest home study & practice, as long as I'm not out there teaching others or claiming to be an expert based on what I learn from home. And I certainly do intend to travel to occasional retreats, etc. ; I just don't have a nearby teacher. I don't even know if this is the tradition for me yet, I am simply trying to learn more about it, the reasons for the rituals, etc. Incidentally, I recently wrote to Robert Thurman and told him of my isolated situation and my desire to learn more about the Tibetan tradition and he didn't make any attempt to dissuade me. He wrote back with some suggested readings and gave me some very sincere advice, none of which was "don't attempt this". I hold him in high esteem, so while I appreciate and respect the opinions of a couple of you that suggested against this, I don't think there's anything wrong with trying to learn more about this practice on my own, with the assistance of reading, reputable websites and input from others about practice. Also, to be clear: I'm not asking for references on the rituals, etc so I can arbitrarily mimic them, I'm asking about what the rituals are so I can study WHY they perform them. That's all to understand the principals of the fundamentals to determine IF it's even something I want to pursue as personal practice. Thanks to all for the book references and home study course links so far! I agree, there's a lot you CAN learn on your own from books and internet resources. And there are *plenty* of practices you can do without empowerment. And, as long as you stick to books written by authorized teachers or scholars, it will be pretty clear which practices would be restricted. So given your apparent respect for the teachings, I don't think there's cause for alarm!